Do you have pets? I know many people who have pets. They have dogs, cats, fish, bunny, and other have weird pets like snake, butterfly and many more. My son loves dog to be a pet but we plan to give him a bunny instead just for a short while. One time a friend of mine ask if we can adopt a cat in the house but i did not accept it because the cat eats too much food then you need to bring it few times to a veterinary. Our budget is just enough for all of us in the house but maybe one day we can get a dog for our son. 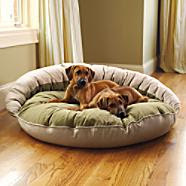 Anyway, if you are looking for a pet beds for your loving pets then you might check out frontgate.com because they have different style and designs. They even have feeders, collars, care & toys, pet accessories, and many more. Head over there now for more details.